The physical sensation gardening brings can be as nourishing as the food and beautiful flowers we reap! And yet many of us after a few short hours in the garden find ourselves with aching backs, stiff necks and knees, and sore shoulders. It’s easy to attribute these sensations to being only a weekend gardener, but there may be another reason for all the aches and painsE a simple misuse of our bodies. For our body to work efficiently, using only the energy necessary for the task at hand, we must have the right ideas about posture and an awareness of these ideas in action through our daily activities. Postural relaxation can only occur when our skeleton is in a balanced, weightE bearing position. Then our musculature is free to move and stabilize our bones. It is our nervous system that controls the neuroEskeletalEmuscular coordination. Our nervous system aligns our posture and coordinates movement through a complex system of reflexes, which constantly strive to keep our body in harmony. If for example, you discover that it is difficult to stand on both feet with your weight balanced, or if just moving is a chore, something is interfering with these reflexes. That something just may be your conditioning. 1) Head/Neck ReflexesE Inner ear reflexes keep your head vertical in relationship with gravity. The head orients it self with the horizon. In doing so it provides you with a sense of equilibrium; a sense of where your body is in space and time. Dropping your head down to read a seed package (bring what your reading up to where your eyes are), or walking across your garden with your head held down for example, stiffens the muscles along your neck. 2) Head/Body ReflexesE Located in your neck, this reflex strives to keep your head and body in constant relationship to each other, i.e. the head over the body or the body under the head. When you bend your neck as you hoe or pick weeds for an extended period, and your head is constantly held downwards, your body begins to follow. The shoulders curve forward and begin to round, and tense. You also override this reflex whenever you turn your head for an extended period of time. Try turning your head to one side and holding it there intentionally, you may begin to sense the subtle but nagging urge to stop twisting your head or to let you body follow the direction your head is turned. That nagging sensation is the reflex signaling you to reconnect. 3) Eye/Head ReflexE this reflex can be observed by gently bobbing the head. As your head moves notice what are your eyes are doing? Are they fixed – i.e not moving? Are you staring? Pause and allow your eyes to relax deep within the sockets. When you interfere with the reflexes tension is provoked around the eyes, neck, and skull. When our eyes move freely, they move in the opposite direction from that of the head, are responsive not frozen and orient with the horizon. When working in the garden, begin by noticing whether or not you find yourself stuck in the same position for long periods of time. Try approaching the task differently; bending, kneeling on all fours, squatting, sitting, standing, rocking, etc. sense the impulse to move and go with it. You will get the chore done just as quickly and with a great deal more comfort and ease. When hoeing or raking, allow the head to return to the upright position so that your focus is greater than the ground in front of you. Let it include not only the immediate area but a sense of the whole, where you are and where you are going. Sense that the pelvis can be loose and weighted and that movement actually starts from the pelvis even when it is the arms that are moving. Sense your knees – are they soft and unlocked? Sense your feet firmly in contact with the earth. When turning, notice where you turn from. Is it your lower back and knees that are twisting and torquing? If so, see if you can sense that turning happens in the hip sockets and the balls of the feet. Please not your hip sockets are located in the front of your pelvis. Learning to use your hip sockets in movements will save your lower back and knees from unwanted damage and stress, while engaging the hip sockets keeps them healthy and mobile. What prevents us from enjoying balanced posture is not what we have been taught to think. It is not those weak abdominal or back muscles that need tightening by way of harmful sitEups. It is just these same already too tight back muscles that thrust our bellies out. Rather, if we release and lengthen the muscles along the back and the deep core muscles of the spine, our whole body can begin to move into a weightEbearing position. The traditional shoulders back, belly in, chin out idea moves us further away from getting in touch with what creates balance and harmony within us. A very gentle and yet incredibly effective way to lengthen our tight back muscles is to release an internal muscle called the psoas. A deep core muscle of the body, the psoas begins just under the diaphragm, attaching along the lumbar spine and moving through the pelvis, inserting near the inner top of the femur (thigh bone). The psoas not only affects skeletal and muscular balance, but also our range of movement, our breathing, and even our organ functioning. When we learn to engage it while we garden (rather than hold it tight), we begin to feel a lightness and freedom of movement that is actually energizing. The following position is one that is easy and will allow your psoas to release thus lengthening and relaxing your back. Try it before gardening or right after; it is very restful. But beware! It also generates energy so it is not the best position for sleep. Find a comfortable padded floor and lie down on your back, knees up, feet on the floor. Your feet will be parallel, and your knees need to be the same distance apart as the feet. Place a folded towel flat no more than one inch thick under the headE just the head, not the neckE so that your whole body is resting along the floor. Arms are placed to the sides, resting on the pelvis or over the chest. It is important to keep the arms below your shoulder height. Let the eyes rest in your head and leave them softly open. You may notice when you first begin that your back has an arch in it. Leave itE do not use force to flatten it against the floor. Instead, allow your thoughts to quiet, bringing your attention to sensations inside your body, especially your pelvic area. You will begin to notice as you rest that your lumbar spine will begin to have weight and will release and lengthen along the floor all by itself. Gravity influences our body in this position by releasing the psoas muscle. Force or muscular effort is neither needed nor helpful. After 10 to 20 minutes, roll to your side and slowly get up on all fours, slowly rising to a standing position. Do not pull yourself up. Once on your feet, take time to observe the many changes and how different you feel. By lying down in the constructive rest position every day, you will revitalize your body. Staying aware of the simple reflexes I have mentioned as well as other messages your body sends you (i.e. thirst, heat, fatigue) will allow for more enjoyment in our gardens. The feelings of satisfaction will then be not only from the beauty and abundance that our gardens give us but also from the vital sense of our body moving, pushing, turning, and gathering. 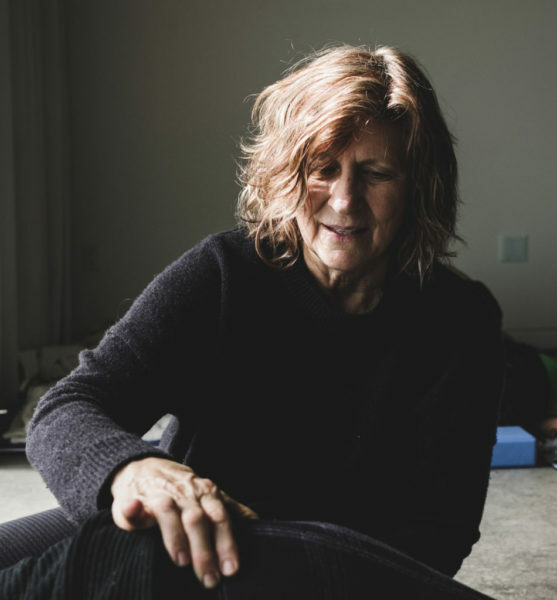 An avid gardener for over 30 years, Liz Koch is the author of The Psoas Book, a comprehensive manual about the psoas muscle. She has taught workshops and classes internationally for 20 years and was a staff member of the Alternative Therapies Unit at San Francisco Hospital. She resides in Felton, CA. Published in Vegetarian Times (USA) Explains how releasing the psoas muscle and developing core awareness can enhance working in your garden. Offers an easy to do exercise for relieving back tension.